These games are familiar to most people, but have been simplified and modified to remove competition and to make them more suitable for dementia and Alzheimer's patients. They offer cognitive stimulation, social interaction and help with dexterity and fine motor skills. Each game includes templates that are used to reintroduce the materials and concepts before moving on to playing the simplified games. The materials can be used individually or in small groups. 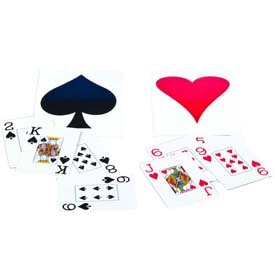 Playing cards are familiar to almost everyone and we build on that familiarity help stimulate cognitive ability for people with dementia or Alzheimer's. The instructions describe how to reintroduce the colors, suits and card values, then move on to playing simple games to add more interest and challenge. 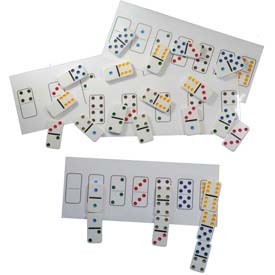 The feel of domino tiles and the sound of them hitting the table trigger pleasant memories for many people, helping them to relate to the materials. The templates are used to reaquaint the person with the concepts through successively more challenging tasks, leading to playing domino games. The colorful shapes on the black tiles naturally draw people’s attention. 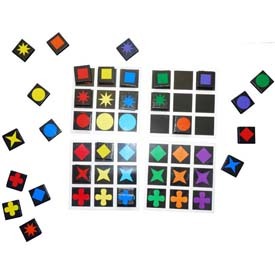 They are fun to look at and handle, and provide the basis for a variety of fun and challenging matching activities and games for people with dementia or Alzheimer's. In addition to the regular templates, this Low Vision Edition includes and additional set of templates with wider spacing to help people with vision problems as well as those who may have trouble placing the tiles on the standard templates. Three different dice games offer varying levels of challenge and engagement, but remove competition and don't require strategy. The games seem simple, but they offer a great cognitive challenge and engagement. In addition, handling and rolling the dice helps with dexterity and fine motor skills. © 2019 Keeping Busy Inc. All Rights Reserved.